For the Harmony 13 stove there is a choice of black or nickle handle. Superb stove, superb after sales! The creme de la creme of stoves. Smaller cousin on the way. Stove expert replied: Small logs work better in stoves and should not exceed 4" diam. Great review. Stove expert replied: Great review and how true, give it time to understand the stove and how it works best. Do not fight it but work with it to get the best out of it. Only ever use dry seasoned wood and the glass should stay clear. Stove expert replied: Exterior flue systems cool quickly and hence can be problematic to light the stove once cooled. If you can heat slightly first it will make things easier (but using a firelighter is no great problem in this case it seems). 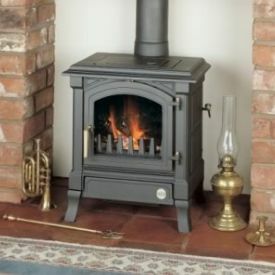 The Nestor Martin Harmony III stove is a classic design with a decent output.